One of the most successful NoSQL database solutions, MongoDB is working on a JSON-like architecture. Combined with Mongo-Express it can kick-start your web project. Here's how to set it up on sloppy.io. Start by creating a new project. For this tutorial I’m naming the project “my-mongo-db”. I'm going to divide it into a “backend” service for MongoDB and a “frontend” service for Mongo-Express. First of all, we’re setting up MongoDB. Type “mongo” into the Image Path field and the first suggestion should be the official repository for MongoDB on Docker Hub, aptly named mongo. Disable the “web app” option, since MongoDB will just work in the background. Now for some Environment Variables. By default, MongoDB doesn't need authentication. Just to be safe, we're going to add a superuser MONGO_INITDB_ROOT_USERNAME and their password MONGO_INITDB_ROOT_PASSWORD. Once this is done, click on “Deploy project” and wait for the service to fully load. 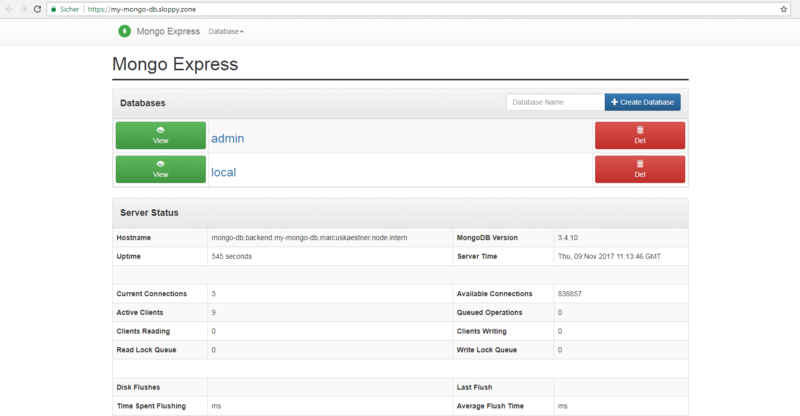 Next is Mongo-Express, the most common administration tool for MongoDB. Once again, typing “mongo” into the Image Path field will yield to a list of suggestions where mongo-express should come in second. Again, this is the official release. Now, choose a subdomain for “sloppy.zone” that isn’t already taken, or set up a custom domain if you’ve already got one. For this tutorial, we’re going with “my-mongo-db.sloppy.zone”. Mongo-Express comes with a variety of Environment Variables for its customization. 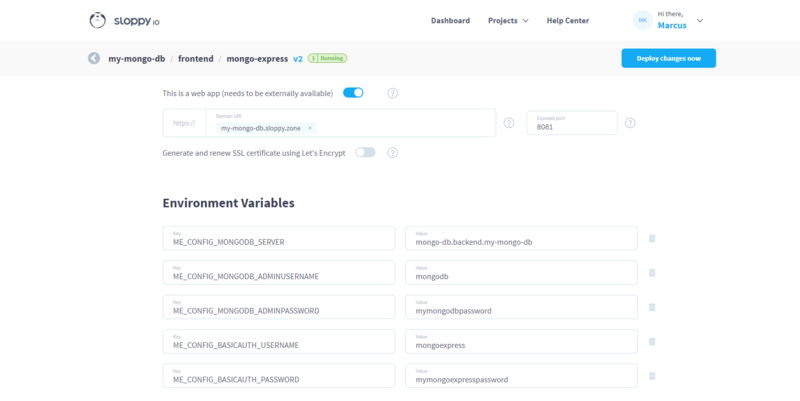 To connect Mongo-Express with our MongoDB, set a ME_CONFIG_MONGODB_SERVER and point it towards MongoDB – in this case mongo-db.backend.my-mongo-db. Note that sloppy.io is making it easy for you by already autosuggesting this. Next come the optional superuser ME_CONFIG_MONGODB_ADMINUSERNAME and their password ME_CONFIG_MONGODB_ADMINPASSWORD, which we have set for MongoDB (see above). To protect Mongo-Express from unwanted guests, we also set up a web user ME_CONFIG_BASICAUTH_USERNAME complete with password ME_CONFIG_BASICAUTH_PASSWORD. Click on “Update project” and wait for both services to load. Then click on the link on the Mongo-Express app or enter your chosen domain into your browser. Mongo-Express will ask for the web user we’ve set up earlier (not the admin user!) and that’s it: you’re ready to go.